Pine Eagle senior Jessica Thatcher, left, and Christina Garciliazo of Irrigon on the right chase a loose ball during the Saturday morning game between the two teams. ECHO - The Pine Eagle Spartans played the Irrigon Knights at the Echo Invitational on Saturday December 6, 2008 during a morning game. It was a close game until the fourth quarter when Pine Eagle outscored the Knights 18 to 8. The first quarter was an evenly played period with the teams tied 9-9 at the end. Irrigon turned up the pressure in the second quarter to take a 17-15 lead into halftime. The third quarter was a low scoring period with Pine Eagle scoring six and Irrigon with only a freethrow by Kim Campos. The end had the Spartans leading 21-18. In the fourth quarter Pine Eagle shut down Irrigon scoring for nearly four minutes while the Spartans scored seven to take a 28-20 lead with four nimutes to go in the game. The Spartans scored nine points in the last two minutes take a 39-26 win. 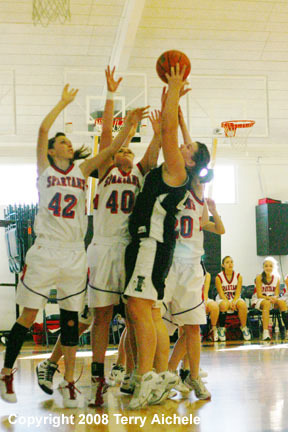 LEFT - Noelle Wright of Irrigon takes a shot over a bunch of Spartan defenders. 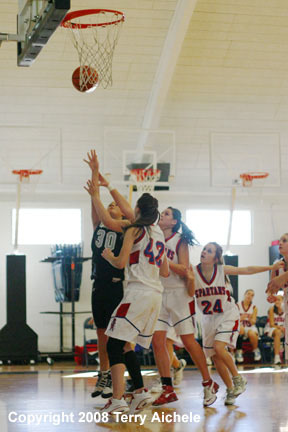 RIGHT - Kendra Kimble of Irrigon drives in for a layup on the game on Saturday. LEFT - Noelle Wright of Irrigon drives to the basketball during the game Saturday. 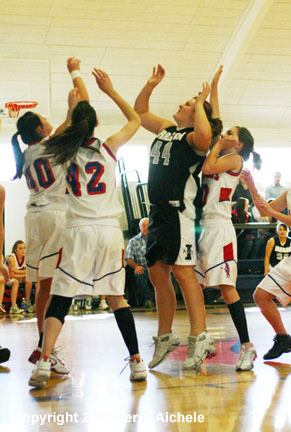 RIGHT - Cheyenne McKenney of Irrigon takes a shot while surrounded by Pine Eagle defenders during the game on Saturday. LEFT - Noelle Wright of Irrigon battles to take a shot during the game on Saturday. 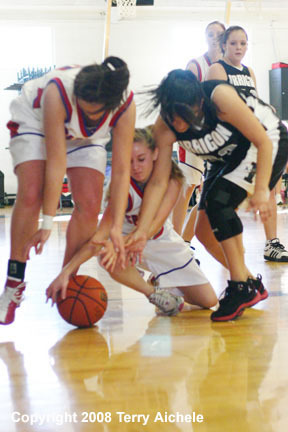 RIGHT - Pine Eagle and Irrigon players battle for a loose ball during the game on Saturday. LEFT - Jessica Thatcher of Pine Eagle and Christina Garcilazo of Irrigon react to a loose ball during the game on Saturday. RIGHT - Noelle Wright of Irrigon takes a shot during the game Saturday. LEFT - Kendra Kimble of Irrigon brings the ball down the court while being closely guarded by a Pine Eagle defender. 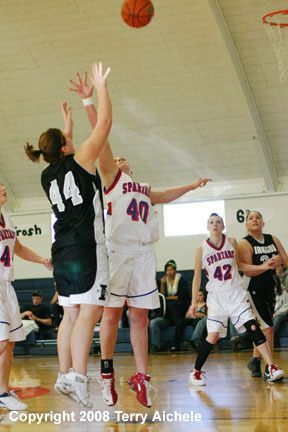 RIGHT - Kendra Kimble of Irrigon takes a shot during the game against Pine Eagle on Saturday. LEFT - Kendra Kimble of Irrigon races on a break during the game Saturday. RIGHT - Kendra Kimble of Irrigon brings the ball around Ashley Butler a Pine Eagle defender.